PASADENA, Calif. — The long-delayed first flight of SpaceX’s Falcon Heavy launch vehicle is now scheduled for April or May of 2016, a company official said Sept. 1. Speaking at the American Institute of Aeronautics and Astronautics’ Space 2015 conference here, Lee Rosen, vice president of mission and launch operations for SpaceX, said the company was also wrapping up work on the renovated launch pad that rocket will use. “It’s going to be a great day when we launch that, some time in the late April-early May timeframe,” he said of the Falcon Heavy. That first launch will be a demonstration mission without a paying customer. That launch will be followed in September by the Space Test Program 2 mission for the Air Force, carrying 37 satellites. Rosen said the company was also planning Falcon Heavy launches of satellites for Inmarsat and ViaSat before the end of 2016, but did not give estimated dates for those missions. 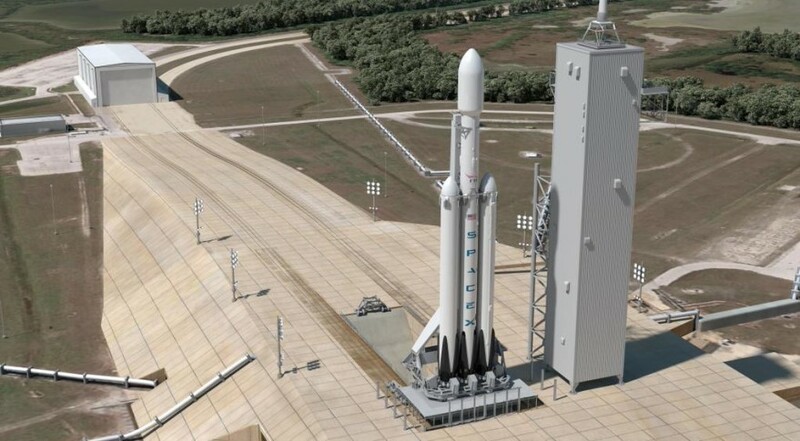 Prior to the June 28 failure of a Falcon 9 carrying a Dragon cargo spacecraft, SpaceX has planned to carry out the inaugural Falcon Heavy launch by the end of this year. At a July 20 press conference, SpaceX Chief Executive Elon Musk said work on the Falcon Heavy would be “deprioritized” while the company devotes resources to return-to-flight activities, delaying the first flight into 2016. SpaceX first announced the Falcon Heavy in April 2011, and at that time said the vehicle’s first launch would take place from Vandenberg Air Force Base in California in 2013. That launch date has steadily slipped, and SpaceX moved the first launch to Launch Complex 39A at the Kennedy Space Center after completing a lease agreement with NASA in April 2014. SpaceX has been renovating that pad to support launches of both the Falcon Heavy and Falcon 9 flights of crewed Dragon spacecraft. That work has included construction of a hangar near the pad and a rail system that will be used to transport the rockets from the hangar to the pad. That work is nearing completion. “That launch site will be operational in November of this year,” Rosen said. That includes completing a milestone in SpaceX’s commercial crew contract with NASA for a launch site readiness review. When Falcon Heavy becomes operational, it will be the most powerful U.S. launch vehicle since the Saturn 5, with the capability to launch up to 53,000 kilograms into low Earth orbit. The vehicle uses three first stage cores of the Falcon 9, including a total of 27 Merlin engines, with some modifications to the structure to accommodate loads of linking the three together.